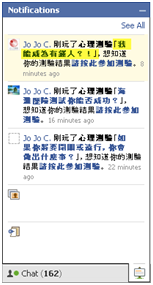 2) If the spam is already on your wall click the application name next to “via” as shown in the screenshot. That link is a link to the applications home page, click the link. TIP: If you are on a friends page you can block applications that show up on there wall – by clicking the application name as described here, a proactive solution to future spam. Either one of these methods described above will bring you to a page asking you whether or not you want to install the application, if you would click "Allow" then all your friends would get the same spam you just got. NOT A GOOD IDEA! The link next to the application icon is a link to the applications home page, click the link that is highlighted in the screenshot. 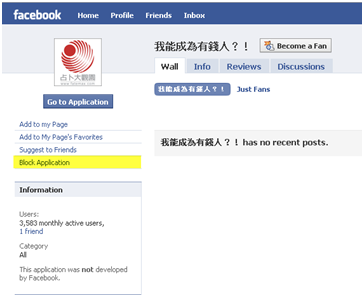 This will bring you to the applications page, click "Block Application". There are only a handful of application that cause spam on Facebook, block them regularly and you will have no spam on your wall. 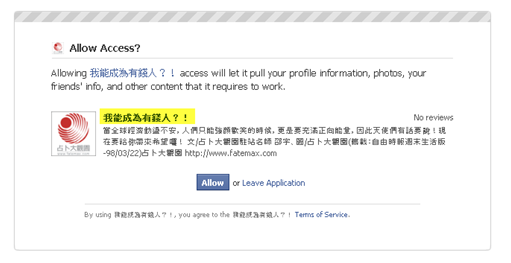 Click "Block APPLICATIONNAME". You have now blocked this application and all of its messages and posts. I have blocked around 20 applications so far, I get spam maybe once a week now. This entry was posted on Thursday, January 28th, 2010 at 9:08 am and is filed under General. You can follow any responses to this entry through the RSS 2.0 feed. You can leave a response, or trackback from your own site.